Our foodie weekend commenced this morning as we finally began to get the hang of living in a new house. We started with a civilised breakfast of a pot of fresh ground coffee, hot brown pitta bread with boiled eggs and cheeses and a flick through some of our favourite cookbooks. Suitably fortified and inspired it was time to hit the town. Down to the Organic Lea stall at the Hornbeam Cafe at Bakers Arms, Hoe Street, E17. We had in mind to buy any type of leafy greens in season. We came away having signed up for a weekly veggie box delivery plus buying purple sprouting brocolli, curly kale, a quarter of a crown prince squash, some dried local mushrooms and a spelt loaf! Next it was the Turkish supermarket Buy & Save and a quick run around the market vegetable stalls for the essentials. With a shopping trolley overloaded with vine tomatoes, a sack of onions, dried chickpeas, thick Turkish yoghurt, yellow split peas, a pack of yufka pastry, a bit of beef mince and some early Spanish strawberries, we were off home. So this evening we have made yufka pastry Beef & Pinenut Burek and a seasonal Brocolli, Gorgonzola & Buckwheat Pilaf, inspired by Jerusalem (Ottolenghi & Tamimi, 2012). Yufka pastry is a Turkish dough made from just flour and water, rolled out incredibly thinly into a massive round pancake. On the markets in Turkey you buy it made fresh by the yufkasi, here in London in the Turkish supermarkets you buy it in a packet. Let it warm up out of the fridge for 5 minutes before trying to work with it otherwise it splits, then work quickly otherwise it dries out and splits – not that this stuff is temperamental! Heat a little oil in a frying pan, add the garlic and onion and fry until softened. 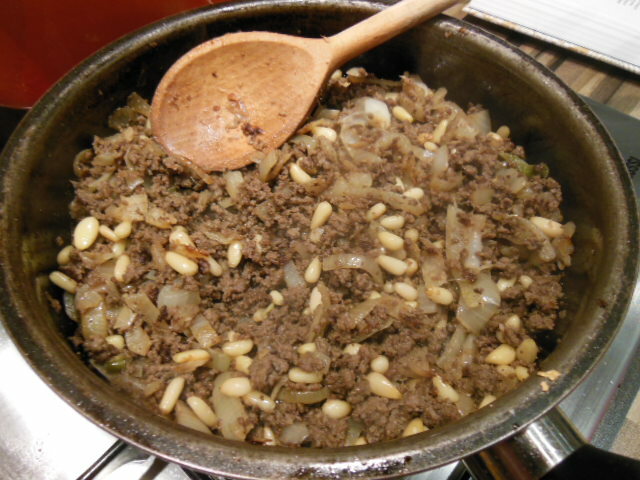 Add the mince and heat until cooked through. Add the pinenuts, lemon juice and all the spices and cook gently for a few more minutes then take off the heat. 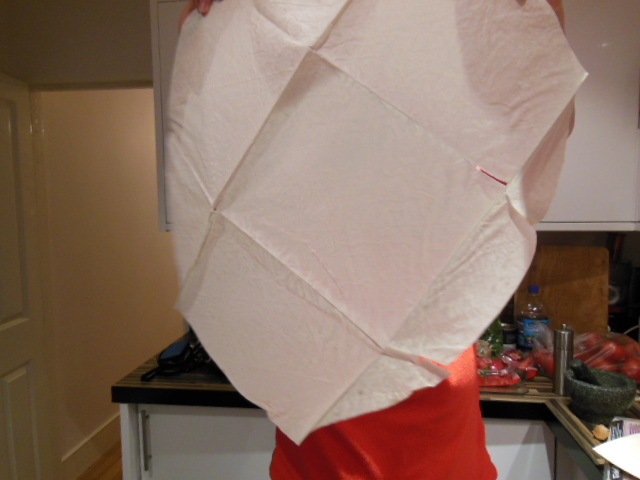 Take a sheet of yufka and cut off a piece about 30 x 30cm. Lay on a board. Brush the edges all the way around with beaten egg. 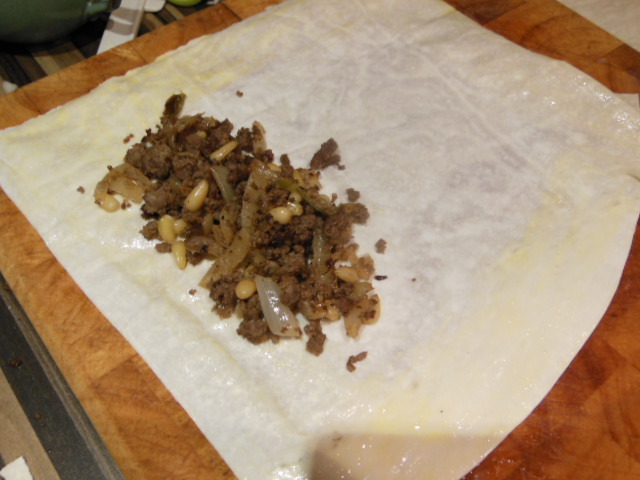 Next lay a couple of dessert spoons of the meat mixture towards the lower edge, fold in the sides and roll up like a cigar. Ensure a good seal by brushing with more egg. Place on a greased baking tray and brush thoroughly with egg and sprinkle with sesame seeds. 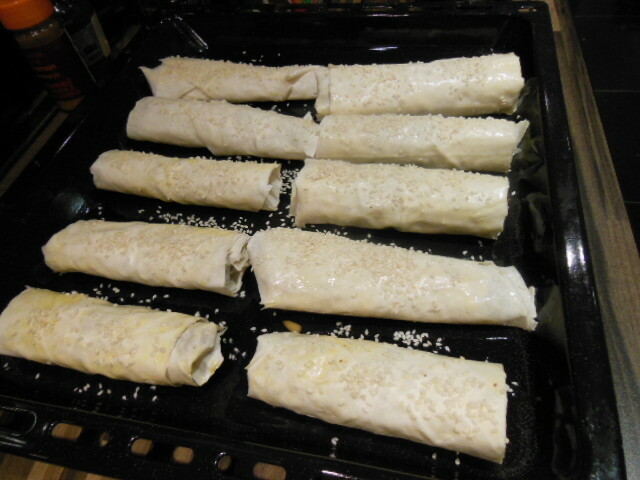 Keep on repeating this process until you’ve used up all the filling or run out of yufka. You could switch to a filling of feta cheese and chilli flakes, spring onion and cheddar, grated apple and cinnamon… you get the idea. Bake in the oven for 15-20 minutes until golden brown at 200C. Serve warm with a dip of yoghurt laced with garlic and Turkish chilli pepper flakes. Tomorrow I’ll post up the Brocolli, Gorgonzola and Buckwheat Pilaf – too tired and happy-full tonight! 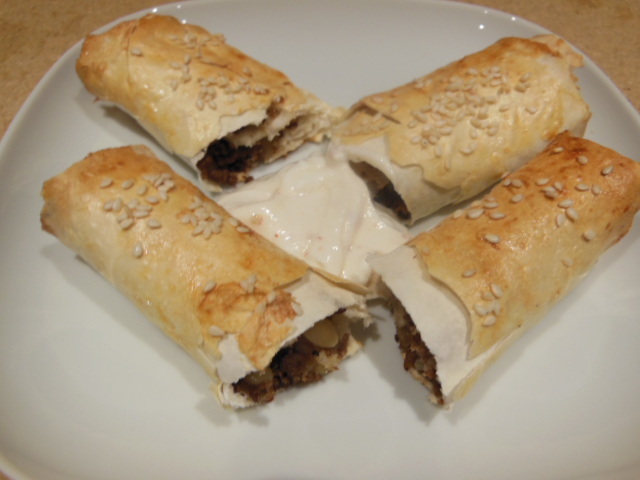 This entry was posted in Recipes, Shopping in E17 and tagged Beef and pinenut burek, Jerusalem, OrganicLea, Yotam Ottolenghi, yufka, yufka pastry. Bookmark the permalink. Thanks they worked out well – had a cheeky one for breakfast this morning! Thanks for your comment.